Sharkoon presents two new vertical USB 3.0 docking stations; a single-bay model and a dual-bay version. 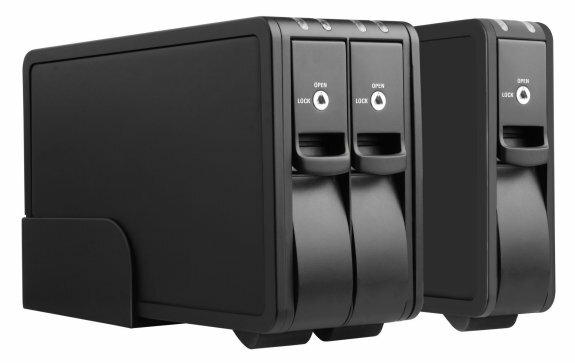 Sharkoon presents two external hard drive docking stations for the USB3.0 interface, in which unobstructed SATA hard drives can be quickly and without effort connected to a computer or notebook. The two Sharkoon Vertical Docking USB3.0 stations, with a choice of either one or two fast-swap bays for SATA hard drives in 3.5 inch format, are equipped internally with a SATA II interface and externally with a USB3.0 SuperSpeed interface. The disks are easily inserted upright lengthwise into the hard drive bay. A lockable front flap secures the drives against unwanted access while a rear fan helps prevent unwanted heat. The Sharkoon Vertical Docking Single USB3.0 Station with its hard drive bay and 40 mm fan measures 212 x 44 x 129 mm (L x W x H) and weighs 650 g. The Sharkoon Vertical Docking Duo USB3.0 Station with its two individually lockable hard drive bays and 50 mm fan measures 222 x 83 x 134 mm (L x W x H) and weighs 860 g.
The matte black, rounded plastic case features an on/off switch, red and blue illuminating LEDs indicating power and data access, and supports the operating systems Windows XP, Windows Vista and Windows 7 (32 bit and 64 bit). Enclosed with both models are a power supply, a USB3.0 cable, two keys and a brief manual.